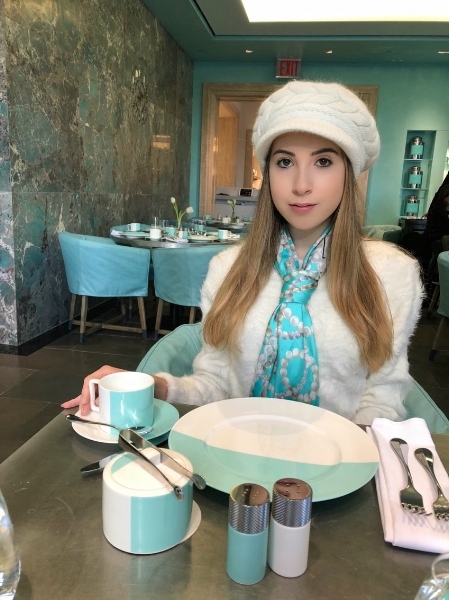 Upon entering the restaurant, I was surrounded by walls the exact color of the famous Tiffany blue box. There were glass cases filled with diamonds and mini Tiffany boxes, as well as giant cans of “Tiffany Tea” on the walls. Even the table setting matched the color of the room, with Tiffany blue and white china and upholstered chairs. 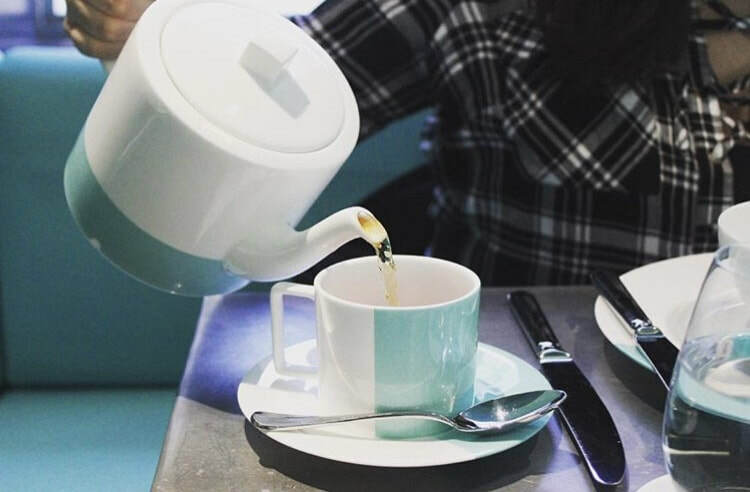 Although the Blue Box Cafe serves breakfast all day (the avocado toast is a customer favorite), I decided to order the afternoon tea. The herbal blend I chose to drink with my meal was called the White Wedding, which was a white tea with Chinese white peony and jasmine leaves, lavender, rose petals, and orange blossoms. The tea did smell divine, but once I tasted it, I realized that I prefer to reserve florals for my nose rather than my taste buds. 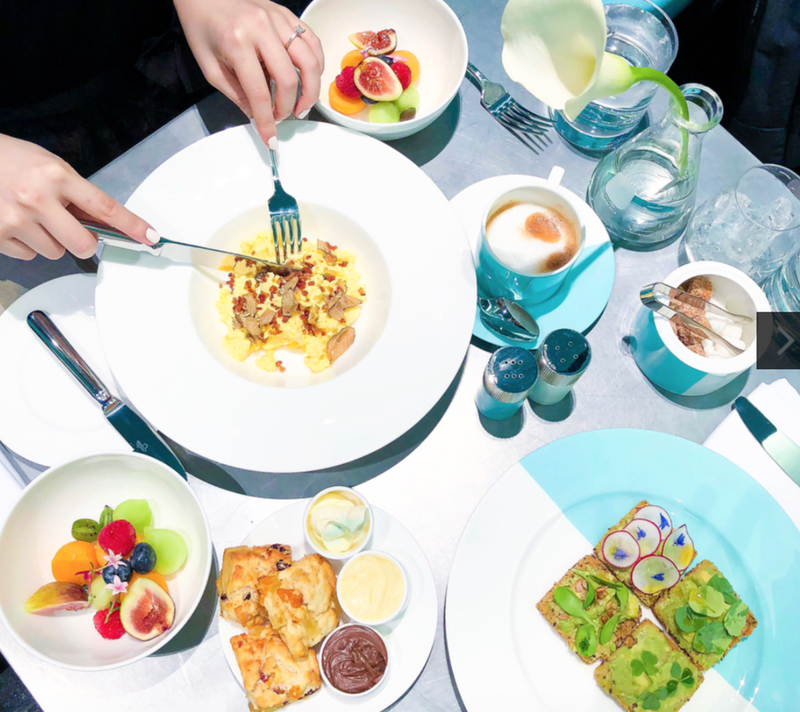 The “Tiffany Tea” came with a selection of four finger sandwiches: herbed chicken salad, smoked salmon with cream cheese, cucumber atop of goat cheese, and hummus & olive tapenade (vegan). Each one tasted fresh and delectable; in fact, these were some of the best tea sandwiches I have ever had! However, I wish that more tea sandwiches would have been provided, since four mini triangles seemed insufficient given the price of the tea package ($50 per head). After nibbling the sandwiches, it was time to move on to my favorite part: the scones! Each guest received two mini scones, one sweet and one savory. They were served with winter fruit preserves, honey butter, and clotted cream with edible glitter! The sweet scone was the best part of the meal, in my opinion, by far, filled with tangy cranberries. I really appreciated the Blue Box Cafe’s fresh take on mini pastries, as they weren’t ones that are typically served at an afternoon tea. The sweets included an edible Tiffany’s bird nest made out of shredded filo dough, Blue Box petits fours, a coconut brownie, a lemon meringue tart, a chocolate ingot sprinkled with real platinum dust, and a lemon jelly square. Yum, yum, and even more yum! And if those treats don’t tickle your fancy, you can also order the Blue Box Celebration Cake separately for $36. 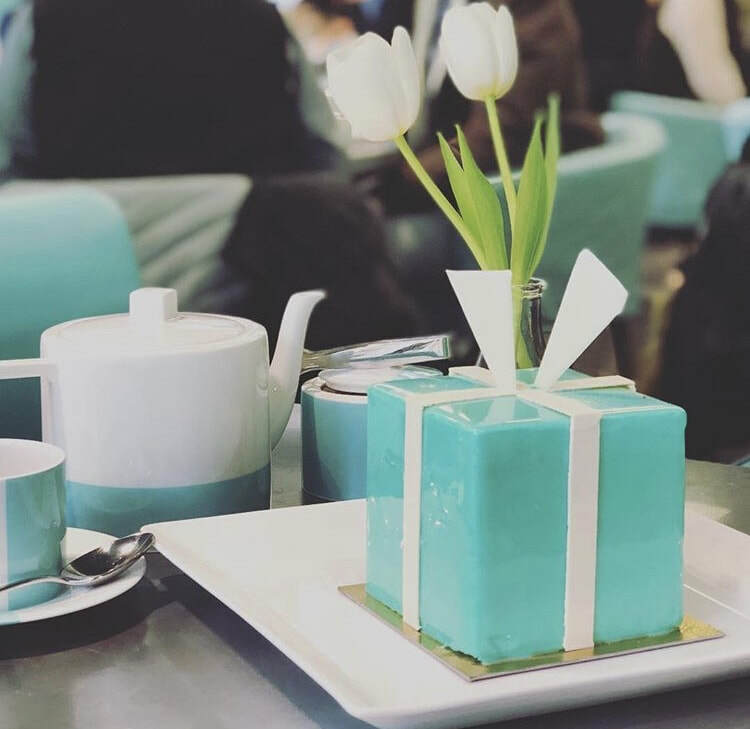 The dessert is a replica of the little Blue Box and is filled with vanilla cake and tiffany blue icing. Although this may seem quite pricey, take my word for it: it’s totally worth it.